For words that are plural, such as “Joneses,” just add the mark. Prediction: in 100 years’ time, the possessives of every word that ends in an S will take a simple apostrophe. That is, of course, if anyone still bothers to punctuate. For now, however, the situation is hopelessly muddled. Our Writing Consultants try to adhere to the simple rules just given, yet in common usage and under “house rules” for various fields of study the matter of correct usage remains far from settled. Consider this set of exceptions from the Grammar United site about the different house styles for AP and University of Chicago formats. Happy reading. Back? Still sane? Good. Now consider a few classic handbooks and the advice therein. 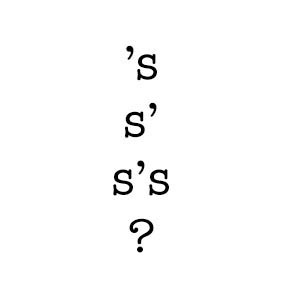 “if the noun is singular and ends in -s or an s sound, add -‘s” (299). Listen for the “S”? Why? I envision people reading their work aloud, no bad thing to do, to hear that “s” sound. So let’s try the grandfather of all usage guides. “It was formerly customary, when a word ended in -s, to write its possessive with an apostrophe but no additional s. . . . In verse, and in poetic or reverential contexts, this custom is retained. . . .But elsewhere we now usually add the s and the syllable” (466). Recent handbooks do a better job. “To indicate ownership, add ‘s to a singular noun or to a plural noun that does not end in s. . .” (151). “If the word is plural and ends in s, add just the apostrophe” (38). “For most plural possessives, use the ordinary plural form and add an apostrophe to the final s” (509). While I remain reverential to the late Diana Hacker, whose books have so long had an honored place in writing classrooms, I am going to come down on the side of the living. American English tends to evolve toward simplicity; in this case, the simpler usage does not remove any nuance from our language, and our Writing Consultants have dragons to slay in student work. They do not have time for this particular gnat, let alone deciding how an S sounds or if the context might be poetic or reverential. Thus, unless a house style dictates otherwise, our Writing Center and I hold with Garner and O’Conner: add an apostrophe only to plural nouns that end in S. Possessives such as children’s hospital or men’s room are different and easy enough. The plurals do not end in an S.
So there we have it, for even the worst possessive obsessive’s grammar notes. Mr. Fowler, rest in peace, please. And I am so pleased that you began a sentence with a conjunction, as I just did. Hah.